PenDelfin leaflet with the PenDelfin rabbit Spud on the front. 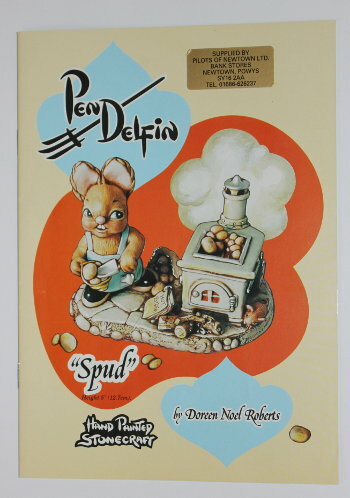 The PenDelfin rabbit Spud was designed by Doreen Noel Roberts and was introduced into the PenDelfin rabbit family in 1997. This PenDelfin brochure opens like a book and has 14 pages featuring PenDelfin rabbits and PenDelfin Display stands that were available to purchase when the leaflet was printed. Inside this PenDelfin brochure it includes different pages with different PenDelfin scenes including the PenDelfin Large House with Mother and Baby & Father rabbit, the PenDelfin Old Schoolhouse with Duffy, Digit, Angelo, New Boy, Euclid and Boswell all in attendance. On another it features Robin's Cave with Glow Light designed by Doreen Noel Roberts! It is a lovely PenDelfin brochure.